1. The size and weight of Asian elephant: The length of its body ranges from 5.5 to 6.4m, tail length is between 120-150cm and the weight is about 2-5 tones. They live in forests and plains of India and Sri Lanka. 2. Geographic distribution: Asian elephants live in huge blocks of forests near grass lands and water sources. They inhabit in Sri Lanka, India, Myanmar, Thailand, Indonesia, Vietnam, Nepal, Bangladesh, Cambodia, Southern china and Lao’s. 3. Diet: Asian elephants would like to have natural diet like wide variety of vegetation, including grasses and herbs, fruits, bark, leafs and farm crops. Besides, facts of Asian elephants tell that they also have Zoo diet. At the Zoo, each day an elephant takes 125 pounds of hay, 10 pounds of fruits and vegetables, 10 pounds herbivore pellets and a few leafy branches. Favored foods of elephant are cultivated crops like rice, banana and sugar cane because they tend to drink at least once a day. 4. Behavior: Facts of Asian elephants revels that Young male and female elephants live in solid herds of correlated adults and their children. The largest and oldest female called Matriarch sets the group activities. Herds link with others and forms large groups named clans. Male elephants leave herds at 13th year and travel alone or in bachelor groups. 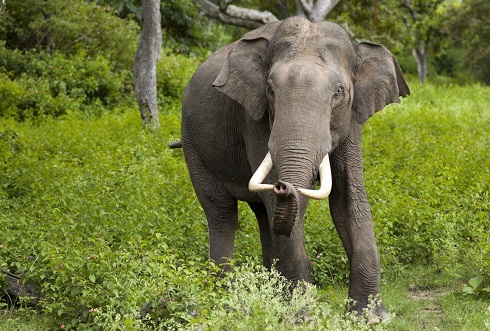 Asian elephants can communicate through growls, moans, rumbles and bellows. Asian elephants are smaller than African elephants and can live about 60 years. Asian elephants are self-aware and highly intelligent.